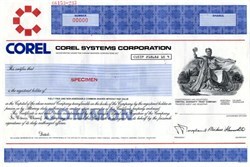 Beautifully engraved SPECIMEN certificate from the Corel Systems Corporation. 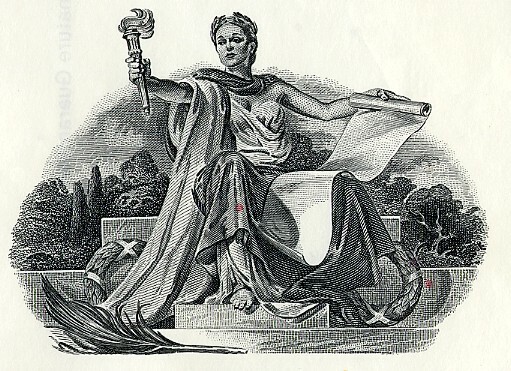 This historic document was printed by British American Bank Note Inc. and has a block border with a vignette of an allegorical woman holding a scroll in one hand and a torch in the other. This item has the printed signatures of the Company's President and Secretary. Founded in 1985, Corel Corporation is a leading technology company that offers software for home and small business users, creative professionals and enterprise customers. With its headquarters in Ottawa, Canada, Corel's common stock trades on the Nasdaq Stock Market under the symbol CORL and on the Toronto Stock Exchange under the symbol COR.